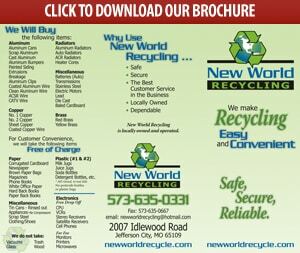 With the majority of our recyclable material coming from other businesses, making the process easy for other businesses to recycle is a priority of ours at New World Recycling. Therefore, we have adopted the practice of coming to you, our commercial customers, for certain products. The services that we provide already are Document Destruction (shredding), Baled Cardboard and Metal Yards/Building Clean-Ups (even farms). We are always looking for other opportunities, so if you think you might have a project for us, give us a call and we will see what we can do to help.